"Make the platter at least 90 lbs heavy and 8 inches tall. Give me multiple motor pods and crisscrossing belts. Use exotic materials we can build a story around. Add a high-mass chromed stand with plenty of margin for us. And make the whole thing big and heavy and complex and mightily impressive to look at." Sometimes, the cynics amongst us could be forgiven for thinking that audio products are designed foremost by marketing men, not serious engineers. Alvin Lloyd of Grand Prix Audio however does approach his job from an engineer's perspective. (He'll learn. Not!) His race car building past isn't mere spin and fluffy decoration without a relevant tie-in to his present occupation. Far from it. That race car past is exactly what enabled advanced engineering applications and the skilled use and manufacture of composite materials. Those already pooled into his very first resonance control project, the popular Monaco Modular equipment isolation stand (of which I own two; count me among the believers in Alvin's design acumen). 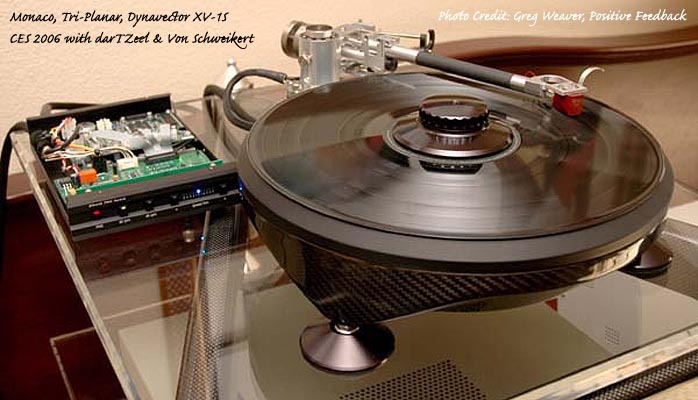 With the launch of the eponymous turntable first shown on active duty in the darTZeel/Von Schweikert exhibit at CES 2006 [above], Grand Prix Audio has leapfrogged out of the perceived audio accessory business. 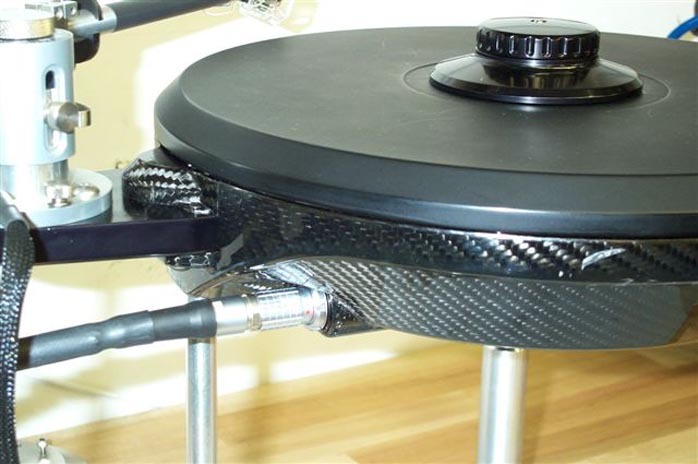 This company has now tackled, head-on and blithely, what knowledgeable insiders regard as the most challenging mechanical construct of audio: the venerable turntable. Therein lies the connection. Mechanical engineering. That's Alvin Lloyd's forté after all. When asked what, exactly, compelled him to embark on this ambitious project, Alvin chuckled. "Same as always. Self gratification. I wanted one for myself. Even with an adequate budget, I didn't see anything already existing in the market that was adequately engineered to merit its expense. Most of it looked like marketing bells and whistles but little actual engineering and performance potential. That might sound haughty but my background compels me to apply very high standards. I felt we could do better, especially from a sophisticated mechanical engineering aspect (though the Monaco ended up turning into a rather sophisticated electronics project as well). Lastly, I envisioned the Monaco as a technological demonstrator for my company's design and manufacturing acumen. Equipment supports still suffer a perceptional hurdle with many audiophiles. They either believe they make no difference or that all available solutions are more or less the same. A turntable, however, is a completely different beast. There can be no debate about how well it is executed, what novel implementations it offers or how well it performs. I hope that once people investigate what we have accomplished with the Monaco turntable, they will revisit our existing resonance control products with a new appreciation for the sophisticated engineering and manufacturing skills that went into them." Three years ago then, Alvin commenced the turntable project as he always does. He took stock of preexisting solutions. He analyzed the innate challenges they addressed and how well they did so. He then determined what, exactly, he would have to contribute to create something demonstrably (i.e. measurably) better. With the famous Rockport as reference, Alvin concurred very quickly - direct drive was the only avenue to overcome the inherent speed stability, energy management, resonance control and mechanical contact-induced noise issues that afflict all belt drives by design. Belts stretch and slack to induce oscillation regardless of platter inertia. This belt behavior manifests as speed variations which, plain and simple, mean frequency distortion (wow & flutter with tape machines). Traditional speed accuracy with turntables is measured with reference records. Those already suffer limitations in their raw manufacturing process. After all, they're cut on a specialty turntable called a lathe. That essentially amounts to using one turntable to measure another. As it turned out, even a custom-cut single-tone test pressing Grand Prix Audio had commissioned from Bernie Grundman proved insufficient to demonstrate the speed linearity which the Monaco's third prototype incarnation already clocked. Its final rumble specs are purportedly superior to what the conventional testing approach can even resolve. Grand Prix uses three sigma measurement protocols for all their data accumulation i.e. 999 out of 1000 times, the Monaco's speed accuracy is better than 0.002%. This means that during the playback of an entire record side, there will never will be a single speed error in excess of .002% from absolute. That's at least 10 times better than the most ambitious specification Alvin could find elsewhere. Most turntable manufacturers rely in fact on averaged RMS values, not worst-case-scenario peak errors - if they publish speed accuracy data to begin with. To reach the unheard-of target figure of 0.002% and green-light the Monaco project for actual production, Alvin had to assemble a team of crack collaborators. They would assist him at tackling rather formidable mechanical and electrical design challenges, source a motor and write the proprietary speed control software. Without his prior employment at the famous California Swift Engineering Race Car Design Company and their involvement in the design, construction and development of a state-of-the-art moving ground plane wind tunnel, the human resource connections required to assemble this team wouldn't have existed. (At the time, this wind tunnel was considered the best such device ever designed. Williams Formula One among other Formula One teams came to California to develop their cars until they could build comparable facilities. One car non-racing readers will recognize from the Swift involvement is the new Ford Mustang Retro. Ford utilized Swift's moving ground plane tunnel to finalize the Mustang's aerodynamics, using a 50% scale model in that facility). Alvin’s mechanical design partner is none other than David Bruns, the actual designer of the Swift wind tunnel facility and designer of its Indy, Formula Atlantic, Formula Ford and Sports 2000 cars. Alvin conceptualizes the design and basic GPA goals and then he and David work together on detail design and documentation. For electronics expertise, he turned to Vince Capizzo, whose background included "the design and development of the Solid State Logic electronics used by recording studios to produce much of the music you listen to worldwide". For software development and laboratory testing, another of Alvin's past professional relationships was called upon. A company that had participated in the development of the Swift Wind Tunnel found this project challenging enough to commit itself for internal technical growth reasons. They viewed the turntable project as a cross-platform opportunity for their preexisting high-speed motion control expertise and assigned Grand Prix Audio proprietary audio usage rights for any developments achieved during their involvement with this project. For motor technology, GPA established an industrial partnership with a manufacturer involved in supplying custom high-tech, brushless low-voltage Hall-sensor-controlled motor solutions for the silicon wafer chip manufacture industry where extreme motion control requirements are mandatory. composite skins filled with polymer damping compounds. 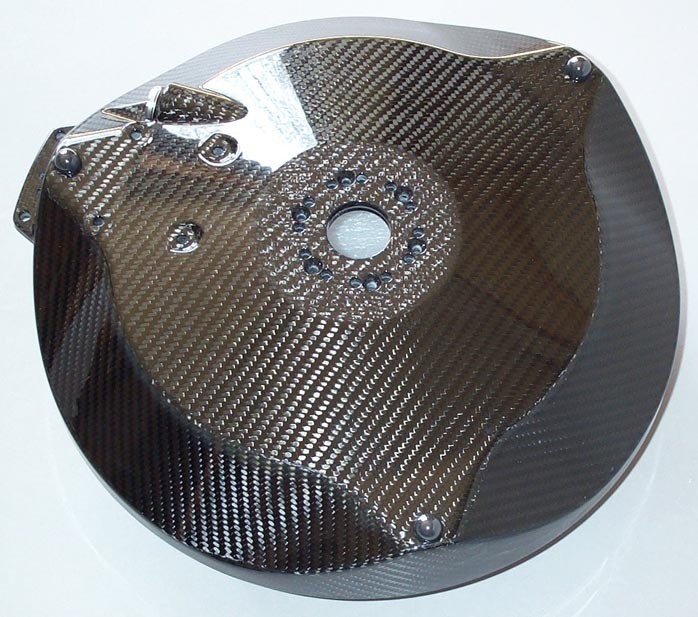 Skin thickness varies from ¼" to more than ½" of solid Carbon fiber. The manufacturing process -- let this sink in -- involves 250psi of applied hi-temperature curing while under vacuum. This process was specifically developed for this project. (For reference, Indy and Formula One car chassis autoclave manufacture takes place under 60psi). Multiple automotive clear coats color-sanded and buffed out finish off the outer composite surfaces of the curvaceously faceted Monaco. 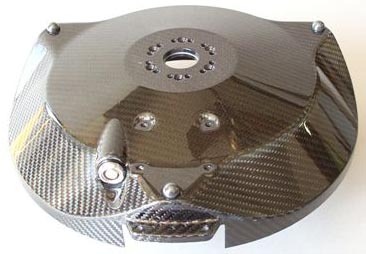 Underneath its platter, the Monaco hides a full 12" diameter optical encoder disc with nearly 5,000 precision markers that can't be detected by the naked eye. A dual-LED beam opposite a reader that brackets the disc like a brake caliper is interrupted nearly 5,000 times per revolution. 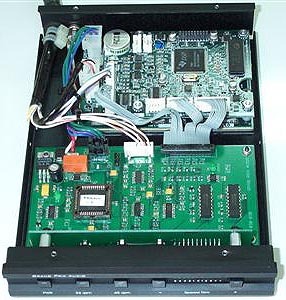 The captured data is fed to the DSP chip and software-driven speed controller. Exactly how this revolutionary optical/DSP interface was implemented to control the motor is proprietary. Alvin Lloyd simply stated that execution wouldn't have been possible as little as 2 years ago. Only recent advances in computer technology allowed for it. CES 2006 incorporated the 5th generation of GPA's proprietary software program. Internal work by the group has since pushed on to generation 7 for yet tighter speed tolerances, establishing the final specification for production deliveries. These advances improved the speed accuracy of the design to beyond .002%, i.e. closer to an actual .0015% peak error versus the debuted version at CES. Gen 7 is what's inside current production tables. The Monaco sits on three custom footers with integral locking mechanisms for leveling and is intended for support on a GPA floor stand or their new Brooklands wall shelf (though non-GPA stands can certainly be substituted). Manufacturing tolerances are better than .001". Considerable cost are involved in the machined aluminum molds used for production of the composite chassis plinth. GPA has already evaluated the SME, Graham Phantom, Tri-Planar, Morch, Wilson-Benesch and Dynavector arms and makes available custom boards for them. Naturally, the firm will engineer arm boards for any brand and make of arm a customer fancies. Due to the design of the Monaco, arm/table matching is viewed as far less critical than usual but the arm/cartridge combination still remains important. The Monaco table retails for $16,000 and can soon be auditioned at Chambers Audio Portland/Oregon; Brooks Berdan Ltd. in Monrovia/LA; Music Lovers in Berkeley & San Francisco; Optimal Enchantment in Santa Monica; Pure Audio in Scotts Valley/CA; the Sound Station in Oklahoma; Ne Plus Ultra in Austin; and in Australia through establishments GPA's importer there will bring on for this product. Further dealerships in the US and abroad will be added later this year. Interested customers should contact Grand Prix Audio for updates and specifics. A surprising number of review requests are presently being entertained, with Michael Fremer at Stereophile and David Robinson of Positive Feedback Online committed to already. Alvin Lloyd clearly doesn't design from a marketing or profit-driven focus. His new Brooklands wall shelf is a limited-sale specialty item if ever there was one. He designed it because "it was needed. There existed no credible high-performance wall-mount options for critical audiophiles. The market lacked a good solution. We knew how to fill it. So we did." In an industry often filled with seemingly capricious solutions for sometimes imaginary problems (or real problems improperly addressed), GPA's self-professed real engineering is quite the breath of fresh air. Perhaps not surprisingly then, GPA's merry band of players sport non-audio backgrounds exclusively. Team Grand Prix taps into industries that have applied far vaster resources to esoteric problems of various natures than audio could ever hope to. Equally as important, the car racing industry is fiercely competitive in a very objective sense. Only one car per race wins. Winning is unambiguous. You're either the fastest or you ain't. This same kind of fierce focus on winning -- measurable, unambiguous, provable -- permeates everything Grand Prix Audio devotes itself to. Though he has long since relocated from California's sunny Mission Viejo to Durango in Colorado, Alvin Lloyd still maintains his souped-up Corvette in the garage. I have a standing invitation to sit in the passenger seat and have Alvin demonstrate a few controlled tail slides and high-speed cornering maneuvers on some remote open stretch of black top. Should I entrust my physical wellbeing to a high-revvin' American sports car? What I do know is that I'd entrust my audiophile wellbeing to any of GPA's products, anywhere, anytime. As stated at the beginning, I've long since become a convert to this firm's solutions. I'm not a vinylist, hence performance commentary on the Monaco table will eventually fall to another member on staff. But simply based on its design brief and how much of it I could understand, this turntable could be as groundbreaking a product introduction in its field as the Monaco Modular was in the resonance control category of component supports. I let the true vinyl experts be the final judges and herewith restrict myself to merely introducing the Monaco table's existence and availability. Over and out then.